PRS100 has a 30% Smaller 18x24" Footprint than PR655-1000E. It is a Single Needle Free Arm Embroidery Machine. Persona PRS100 is the most versatile single needle embroidery machine with free arm embroidery that can do sew much more! 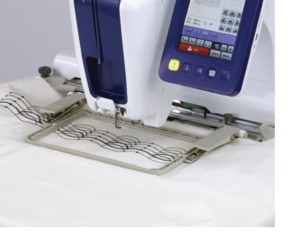 Its tubular free arm configuration gives you the flexibility and ease to embroider difficult to reach areas, all while reducing fabric tangles. Advance your creativity with key features such as anytime bobbin access, the large embroidery area, free arm embroidery and the Droplight™ Embroidery Positioning Marker. Sew Versatile. Sew Creative. Sew Much Personalization. 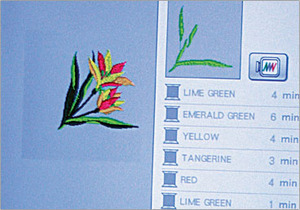 Ever wish for an affordable, easy to use, single needle embroidery machine that could do many things a multi-needle could do? Plus, so much more? 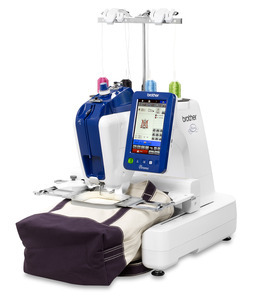 Brother, an industry leader in multi-needle machine technology, introduces Persona, a single needle embroidery machine with multi-needle versatility. Why is Persona A Singular Sensation? The days of struggling to embroider finished or cylinder materials, or opening seams to get items hooped properly, are now over! 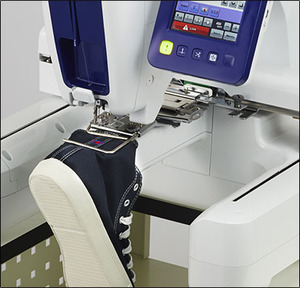 The unique tubular free arm configuration in Persona gives you the flexibility and ease to embroider difficult to reach areas such as pockets and sleeves. Plus, it helps to reduce fabric tangles! The tubular free arm and the introduction of our new compact mini frames truly make Persona a "singular sensation". 405 Built-in designs, infinite possibilities! 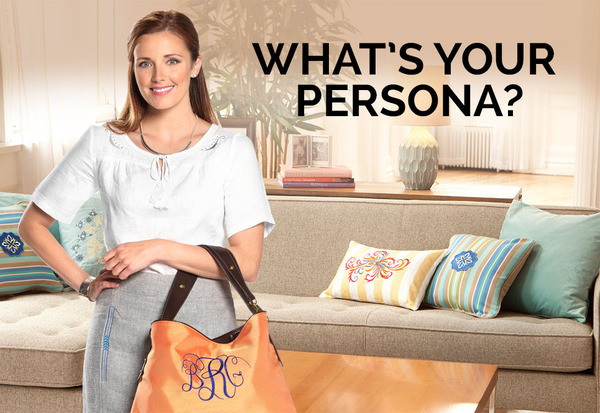 Explore the extensive, awe-inspiring collection of Persona with out-of-the-box access to patterns that include Vintage, Trendy and Floral Alphabet Designs. Set your creativity free with the ability to add a personal touch with a professional finish. 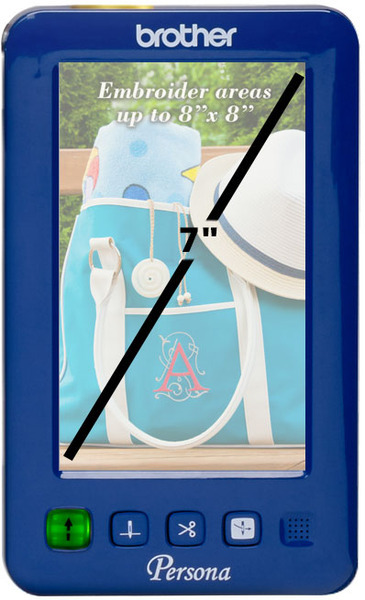 New exclusive compact mini frames, ranging in sizes from 1.25" x 1.75" to 2" x 2"
+All iBroidery.com designs including Disney/Pixar/Frozen are available for additional purchase. Introducing A New Singular Sensation: Persona PRS100. Persona PRS100 is the most versatile single needle embroidery machine featuring the latest in Brother innovation! Check out our video to learn more. 405 Contemporary Designs & 20 Fonts Built-In | Persona PRS 100. 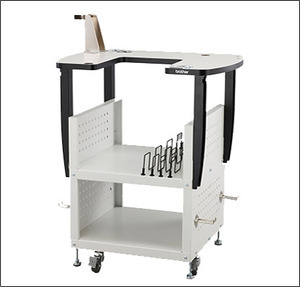 Fresh, modern designs in an innovative new machine. Our new singular sensation, the Persona PRS100 by Brother, has more design options for a greater range of projects and is the most versatile single needle embroidery machine featuring the latest in Brother innovation. Import Your Own Data Through Your USB Stick | Persona PRS 100. Enjoy the Large 7" LCD Touchscreen with Persona PRS 100. With easy and intuitive operation, the large 7" LCD touchscreen is one of many advanced features of our new singular sensation, the Persona PRS100 by Brother. Watch the most versatile single needle embroidery machine in action! Persona PRS 100 & Color Sort. Sorting colors for your embroidery is easy with the new Persona PRS100 is the most versatile single needle embroidery machine featuring the latest in Brother innovation! Easy Upper Thread Change with the Persona PRS 100 by Brother. Watch how easy it is to change threads with the new singular sensation by Brother, the Persona PRS100. 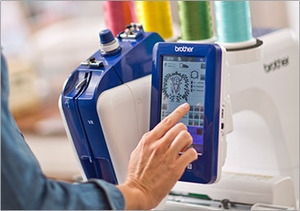 It's the most versatile single needle embroidery machine featuring the latest in Brother innovation! 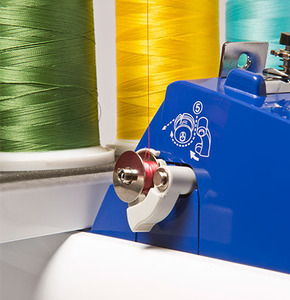 Watch how easy it is to change the bobbin - even while you're embroidering - with the new singular sensation by Brother - the Persona PRS 100. Enjoy greater efficiency with a built-in bobbin winder. Persona PRS100 is the most versatile single needle embroidery machine featuring the latest in Brother innovation! Hooping a hat for the Brother Persona PRS 100 with Optional Cap Equipment. First of many videos to come ahead. I hope that this video helps you see how easy hooping a hat really is. My name is Shawn Woodell at Heavenly Soaps & Such. In this video, I show you how I monogram a hat using my Brother Persona PRS 100 Embroidery machine. I hope you enjoy the video! Thanks for watching! LCD Size (Horizontal x Vertical) inches: 3.2" x 6"
Maximum Embroidery Area (X x Y): 8" x 8"
Built-in Alphabet Designs: 6 alphabet designs - Floral, Appliqué, Greek, Vine, Classic & "ⒸHang To Dry"
Brother Compatibility Chart for PRS100, PR670E, PR1050X and Brother Hoops that Work with each model. 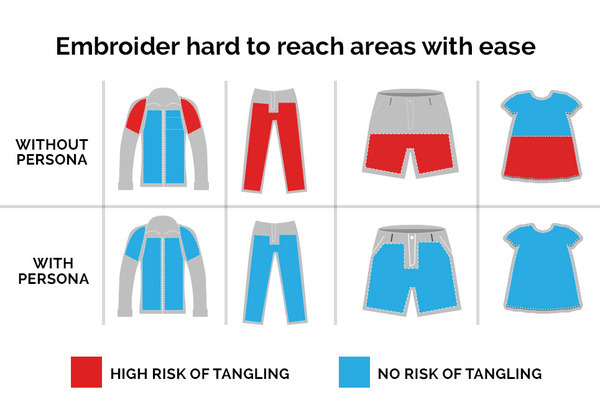 No risk of tangling fabrics on hard to reach areas. EASY TO USE, WITH BROTHER FEATURES YOU HAVE ALREADY LOVE. Easy to use 7" LCD Display Watch on-screen tutorials, and control the machine with the large, intuitive on-screen icons. See up to 260,000 colors with little or no on-screen color shifting. Built-in dual USB ports. Import and export designs from your USB memory stick. Use the second port to connect to your computer to import and export designs or perform machine updates. Side Bobbin Winding. 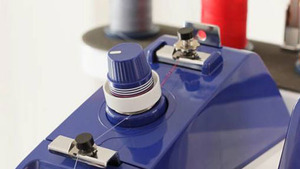 Save time while you embroider with the easy access side bobbin winding system! Wind a new bobbin while the machine is embroidering. Brother recommends 90 weight bobbin thread. Vertical Bobbin – Anytime Access! 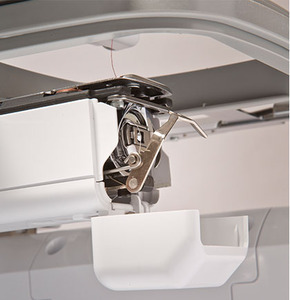 "Anytime" access to the vertical bobbin located at the end of the tubular arm lets you easily change the bobbin without having to remove the hoop. Easy Thread Color Changes. The easy threading system allows you to tie the next color thread to the existing one and pull all the way through to the needle. This is made easy with the 4-Spool Thread Stand. The unique design keeps thread tails out of the way. Go Monochrome. with one touch! Push one button and sew an entire design in a single color with no stops for color changes. 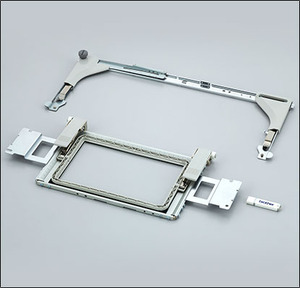 Easy One-touch Frame Adjustment. Move the frame on the LCD with your finger and watch the frame on the machine move! 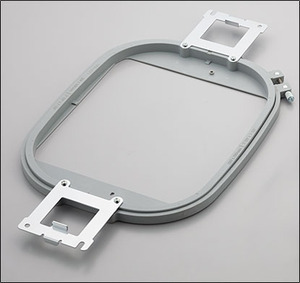 Optional Center Shoe Clamp Frame. Ideal for the back of a shoe or shoe tongue, this frame is designed with exceptional grip strength to hold the items in place during embroidering. DISNEY IS IN OUR DNA. 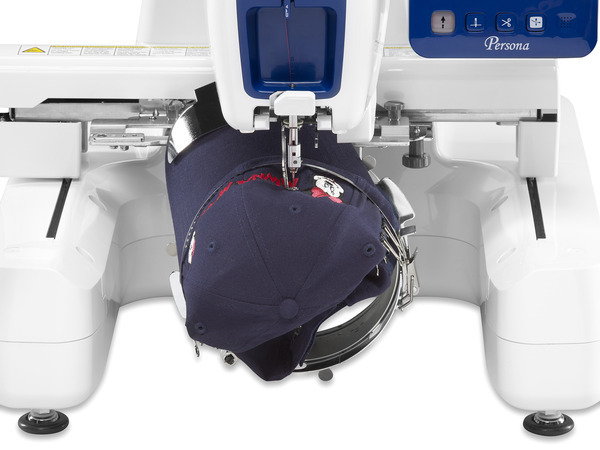 Hats off to the Persona Easily embroider a range of designs on caps with the optional cap frame. And, for the first time ever, you can embroider your favorite Disney characters on caps by accessing designs on iBroidery.com! Brother gives you exclusive access to the iBroidery.com Design Download Center, where you can choose from over 1,000 embroidery designs featuring Disney and Disney/Pixar characters. Purchase and download only the designs you want - no subscription required. I love my new persona. I also have a pe 770 but since I got my persona I haven't used it. It was so very easy to learn to use and each day it seems I find something else about it that I love.